The initial band lineup has been announced for the eighth edition of ShipRocked, set for January 16-20, 2017 onboard Carnival Victory. Headliner BREAKING BENJAMIN will join PAPA ROACH, ALTER BRIDGE, SEVENDUST, POP EVIL, THE STOWAWAYS all-star band and more on The Ultimate Rock ‘N’ Roll Cruise as it sails from Miami, FL to Grand Turk in the Turks & Caicos Islands. Echoes PAPA ROACH vocalist Jacoby Shaddix, "We’re super stoked to come floating on a big boat with all our friends." Ladies and Gentlemen! Boys and Girls! Freaks, Geeks, and Weirdos of all ages! It’s time to roll up for our annual rock & roll revue! That’s right, it’s The Greatest Vacation On Earth, under the ShipRocked Big Top! 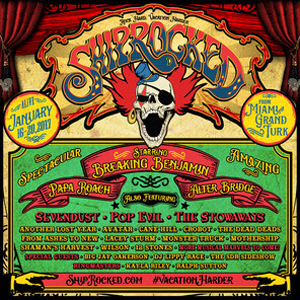 ShipRocked 2017 stars Breaking Benjamin, Papa Roach, Alter Bridge, Sevendust, Pop Evil and The Stowaways. The floating extravaganza also features Another Lost Year, Avatar, Cane Hill, Crobot, The Dead Deads, From Ashes To New, Lacey Sturm, Monster Truck, Mothership, Shaman’s Harvest, Wilson, and 12 Stones, plus the comedy of Big Jay Oakerson; D.J. Lippy Rage; The S.D.R. Sideshow; with ringmasters Kayla Riley of SiriusXM’s Octane and Ralph Sutton of The Tour Bus Radio. ShipRocked’s own all-star band THE STOWAWAYS and its revolving cast of special guests will once again be pulling out all the stops with classic hits, unexpected surprises, and a roster of performers that can’t be seen anywhere else. Check www.ShipRocked.com for the latest on ShipRocked 2017 and THE STOWAWAYS’ 2017 lineup.